Internet services and media giant AOL this morning announced that it has kicked off a “Dutch auction” tender offer to buy back shares of its common stock up to an aggregate purchase price of $400 million, which includes the roughly $40 million left from the initial $250 million stock repurchase authorized in August of 2011. Under the terms of the proposed tender offer, AOL’s shareholders will have the opportunity to tender some or all of their shares at a price within the range of $27 to $30 per share. AllThingsD earlier this week reported that this announcement was forthcoming. 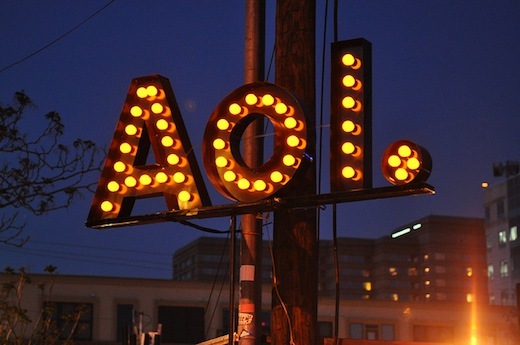 In total, AOL says it intends to return approximately $1.1 billion to shareholders this year. The company considers the share repurchase the best way to realize its gains from the recently closed $1 billion+ sale of over 800 of its patents and patent rights to Microsoft. “Today’s announcement is an important first step in returning 100% of the proceeds from our patent transaction as expediently and tax efficiently as possible,” said Tim Armstrong, chairman and CEO of AOL. The tender offer will be managed by Allen & Company. NEW YORK–(BUSINESS WIRE)–AOL Inc. (NYSE: AOL) (“AOL” or the “Company”) announced today that it has commenced a modified “Dutch auction” tender offer to repurchase shares of its common stock up to an aggregate purchase price of $400 million. The $400 million aggregate purchase price of shares of common stock sought in the tender offer includes the approximately $40 million remaining from the initial $250 million stock repurchase authorized in August of 2011 and brings the total amount AOL intends to return to shareholders in 2012 to approximately $1.1 billion. The tender offer begins today, June 28, 2012, and will expire at 5:00 p.m., New York City time, on August 2, 2012, unless extended or earlier terminated by the Company. Under the terms of the proposed tender offer, AOL’s shareholders will have the opportunity to tender some or all of their shares at a price within the range of $27.00 to $30.00 per share. AOL intends to return 100% of the proceeds from the sale to Microsoft Corporation of over 800 of the Company’s patents and their related patent applications to shareholders. Currently, AOL’s preferred method of returning the proceeds is via a share buy-back either through open market repurchases or a tender offer. However, due to the size of the buy-back relative to our current market capitalization and our desire to preserve our large tax attributes which could be diminished should we trigger a “change of control” as defined by Section 382 of the Internal Revenue Code of 1986, as amended, the Company needs to approach the 100% return of the patent proceeds in multiple steps and potentially through several methods. These methods could include a tender offer, share repurchases in the open market, privately-negotiated transactions and the payment of dividends. We are confident that given the different alternatives of returning the patent proceeds to shareholders we can return 100% of the proceeds by year-end 2012 without affecting our valuable tax attributes. Based on the number of shares tendered and the prices specified by the tendering shareholders, AOL will determine the lowest per share price within the range of tenders that will enable the Company to buy $400 million in shares, or such lower amount depending on the number of shares that are properly tendered and not properly withdrawn. All shares accepted for payment will be paid the same price, regardless of whether a shareholder tendered such shares at a lower price within the range. If the tender offer is fully subscribed, then shares of common stock having an aggregate purchase price of $400 million will be purchased, representing approximately 15.8 percent to 14.2 percent of AOL’s issued and outstanding shares as of June 14, 2012, depending on the purchase price payable for those shares pursuant to the tender offer. Shareholders who have questions may call Allen & Company, LLC, the dealer manager for the tender offer. The information agent for the tender offer is Georgeson Inc. and the depositary is Computershare. The offer to purchase, the related letter of transmittal, and the other tender offer materials will be mailed to AOL shareholders shortly after commencement of the tender offer. Shareholders who have questions or would like additional copies of the tender offer documents, when available, may call the information agent at (877) 278-8941. Banks and brokers may call (212) 440-9800. While AOL’s Board of Directors has approved the making of the tender offer, none of AOL, its Board of Directors, the dealer manager, the depositary, or the information agent make any recommendation to any shareholder as to whether to tender or refrain from tendering any shares or as to the price or prices at which shareholders may choose to tender their shares. AOL has not authorized any person to make any such recommendation. Shareholders must decide whether to tender their shares and, if so, how many shares to tender and at what price or prices. In doing so, shareholders should carefully evaluate all of the information in the offer to purchase, the related letter of transmittal, and the other tender offer materials, when available, before making any decision with respect to the tender offer, and should consult their own financial and tax advisors. The offer to purchase, the related letter of transmittal and the other tender offer materials will be mailed to AOL shareholders shortly. Shareholders should read those materials carefully when they become available because they will contain important information, including the terms and conditions of the tender offer. AOL’s directors and executive officers do not intend to tender their shares in the tender offer.